Jhumka Gira Re Lyrics and Translation: Let's Learn Urdu-Hindi - Mr. & Mrs. 55 - Classic Bollywood Revisited! Our next translation comes from Raj Khosla’s evergreen thriller Mera Saaya (1967) starring Sadhana and Sunil Dutt. A memorable film with an even more memorable soundtrack composed by Madan Mohan and penned by Raja Mehndi Ali Khan! The two Lata solos “tuu jahaa.n jahaa.n chalegaa” and “naino.n me.n badraa chhaaye” get all the critical acclaim, but can you guess which song has achieved the most popularity among fans over the years? Even a folk number can’t stop Sadhana from showing off her characteristic fringe! A montage of sights and attractions in Bareilly, India. Who knew? After taking in our small cultural lesson for the day, make sure you listen to this classic fok dance gem and follow along with our glossary/translation below. You might expect a light-hearted song like this to be very easy to understand, but there is definitely some interesting vocabulary to be learned here! Enjoy! P.S: Don’t you just love it when the random male interrupts with the “phir kyaa huaa?” each time? It’s my favorite part! My earring fell in a market in Bareilly. My earring fell, my earring fell, my earring fell. My beloved came into the house furtively with a lowered gaze. I tried to release myself several times, but my beloved did not let go my wrist. Oh! He did not let go of my wrist. Then? Then, my earring fell during our ensuing quarrel. I stood on my house’s rooftop terrace while my beloved stood in the alley below. Standing on the roof, I became filled with shame. I became filled with shame. Oh lord! Then, my earring fell in the midst of our love. In the garden, my beloved tied and unraveled my braids. With a lowered gaze, I said nothing; I smiled quietly. When my beloved teased me, a scuffle ensued. phir jhumkaa giraa re, mai.n kyaa boluu.n bekaar me.n? Then, my earring fell. What shall I say in vain? 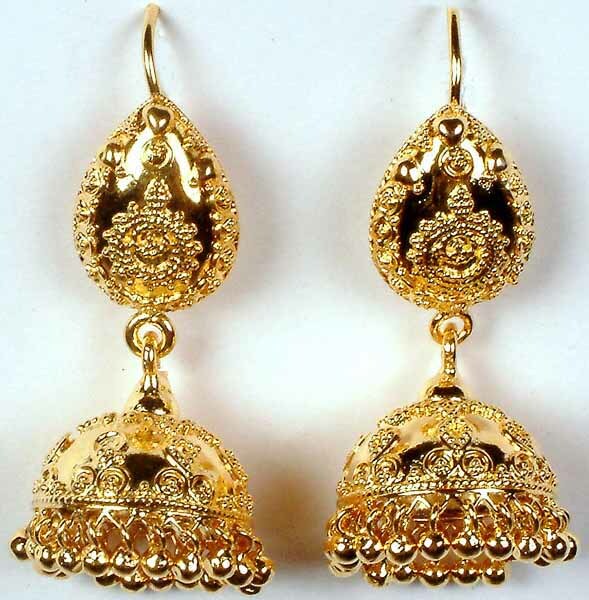 jhumkaa: earring; Bareilly: a city in Uttar Pradesh, India; saiyaa.n: beloved; nain jhukaanaa: to lower one’s gaze; chorii-chorii: quietly, furtively; pahnaa denaa: to help someone wear; baa.nkii chhorii: dear; joraajorii: aggression; chhuDaanaa: to release, disengage; kalaiyaa: wrist; Takraar: quarrel; chhat: rooftop; galii: alley; dilbar jaanii: beloved; anguuThii: ring; chhalla: ring; nishaanii: sign; sharam se paanii honaa: to become filled with shame; daiyaa: oh lord, an exclamation; bagiyaa: garden; balmaa: beloved; laT uljhaana: to tie braids of hair; laT suljhaanaa: to unravel braids of hair; thaamnaa: to hold, embrace; gorii: fair girl; man bhaanaa: to please the mind; dhiire se: quietly, slowly; chheDnaa: to tease; haathaapaayii: scuffle; bekaar me.n: in vain. Thank you! The regional influences (especially from Bengal and Maharashtra) on Bollywood movies and music is very interesting. I’m totally addicted to your blogs! As for ‘jhumka gira re’ — as much as I love Sadhana, I can’t help but notice that she’s no dancer. Her excruciatingly rapid change of face expressions draws your attention away from it, though. A fun observation: Sadhana repeats this look (sans jhumkas, of course) three years later in ‘yeh parda hata do’ from Ek Phool Do Mali. Thanks for reading! I must agree with you here. Sadhana is a lovely and elegant actress but her dancing in this number leaves something to be desired. Where have you come from darling, with love in your eyes? All of the lyrics of this song are fab…and the song itself is fab..however I do wish they didn’t have to picturise it the way they did…seems like a bit of a waste. Thanks for your compliments! Female ornament songs hold a special place in Bollywood cinema, and “kajra muhabbat vaalaa” is an excellent example. Kismat, as a film, is entirely mediocre, which is why the picturization is not up to par. However, the lyrics are quite fun indeed — we may do a whole translation in the future! I looove the Parakh song, also picturised on Sadhana who looks so young, fresh & beautiful! Especially these words – “thande thande hare hare neem taley” – transport one right among the breezy shade of a neem with its unique whiff redolent in the breeze. The entire act of grooming is so enticingly captured in visuals even if not specifically spelt out in words …. I just noticed a minor mistake. The word here is actually “chhallaa” which is another term for ring. And phe.nknaa means to throw/toss. I actually had your interpretation written first, but changed it because I had difficulty hearing the ‘y’ of the second yaa. But if you also hear yaa, then I’ll update the post to reflect this change. We really appreciate your careful reading of our posts! It is wonderful how the lyrics convey that the losing of the earring is actually the heroine losing her heart/innocence to her lover. Sadhana makes a joke of the affair in her nonchalant attitude style of singing and dance but it is serious stuff to the villagers listening attentively. Indeed, the metaphor of a woman losing her earring for loss of innocence is employed beautifully in this song. Thanks for this insight! My Hindi is, shall we say, rather ‘kaacha paaka’. I was at a loss for understanding the flowery Urdu poetry in old Bollywood. Most DVDs offer an abhorrent, if not offensive, subtitled translation. Then you guys came along with a translation that does the filmmaker justice, and include a vocab lesson too! I LOVE this blog! 🙂 I hope you’ll find time to revive something for Diwali! Perhaps Ratan or Paigham? Which part of India is Bareilly located?